*The original book behind the Myers-Briggs Type Indicator (R) (MBTI (R)) test*Like a thumbprint, personality type provides an instant snapshot of a person's uniqueness. Drawing on concepts originated by Carl Jung, this book distinguishes four categories of personality styles and shows how these qualities determine the way you perceive the world and come to conclusions about what you've seen. It then explains what they mean for your success in school, at a job, in a career and in your personal relationships. 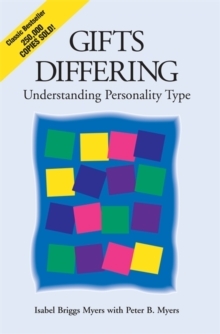 For more than 60 years, the Myers-Briggs Type Indicator (MBTI) tool has been the most widely used instrument in the world for determining personality type, and for more than 25 years, Gifts Differing has been the preeminent source for understanding it.